Disorienting Dharma: Ethics and the Aesthetics of Suffering in the Mahabharata. Emily T. Hudson; Oxford University Press, YMCA Library Building, Jai Singh Road, New Delhi-110001. Suffering is a natural fact of existence that cannot be wished away or denied. And recognition of this fact is apparently the beginning and end of all human wisdom. Small wonder then, that this problem is highlighted by all great works of literature irrespective of geography, time or culture. And over many years of human history this one narrative strand is maintained by all genuinely sensitive poetic minds, and integrated into their poetic vision. The book is a delight to pore over — in some places as interesting as the basic text of the Mahabharata itself, for anyone interested in those serious aspects of Indian aesthetics and narratology, where the drama of human suffering is narrated and close-examined under the scanner of societally-evolved dharma. Five intriguing chapters with a conceptually and critically dense introductory chapter comprise the present book. The idea of Indian narratives is close-examined and the central concepts of dharma anddukha are highlighted. At the very outset, the significance of the Mahabharata as a most important source for the study of South Asian religious, social and political thought, and as a vehicle for transmitting dharma (moral religious and social duty or virtue) is hinted at, and the work approached as a document exposing the societal norms, regulations, ideology and the cardinal issues of a tragic sense of life. The cardinal issue of the Mahabharata is human suffering seen against the social texture of dharma and thus the central aesthetic experience of the text lies in its epical preoccupations with death, destruction and ruin. In Emily Hudson’s words, this sensibility is the weight of human affliction, which is borne out in the narrative by the continuous line of travails that each character undergoes in the course of the narrative. Indeed, Ugrasravas, one of the principal narrators of the epic declares that after listening to the Mahabharata, one will never despair, even in dire situations. 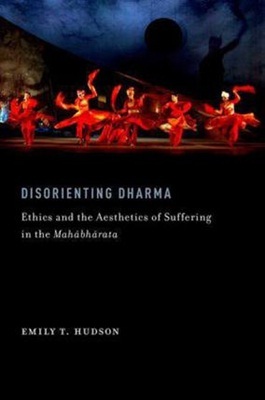 This is in direct line with Hudson’s thesis which goes on to argue that one of Mahabharata’s tasks is to refigure the reader’s understanding of suffering and her own professed engagement in her book is to de-center discussions of ethics in the text from the general topic of dharma and to re-center it on the issue of suffering and the intricacies of its relationship to dharma. Hudson initiates her reading of the Mahabharata through what she establishes as the lynchpin of its narrative: the game of dice and the consequent violation of Draupadi. In her reading she also invokes the characters of Yudhishtra, Dhrtarashtra and Duryodhana and interrogates them in their situational contexts vis-à-vis the plot. There is a certain sense of inevitability in the tale which is always foretold and the perspective constantly is shifting whenever the question of dharma is invoked at any point in the tale. It is as though the narrative is pushing the reader/listener away to a safe distance that affords a wider vision of the human situation. The disconcerting relationship between dharma and suffering is fore-grounded in the intimate aesthetic experience that the sahrdaya undergoes during the ill-fated moment of the dice game, the disrobing of Draupadi and the disastrous consequences thereon to all the characters. Everything that happens leads to the war. As Hudson points out the blind King Dhrtharashtra sees with insight but does not act with it. The purpose of the tale as it unfolds terror and fear in constant succession in the minds of the reader/listener is definitely cathartic. Time itself figures as a character definitive in the scheme of things. Paul Ricoeur in his Time and Narrative had drawn a distinction between tales of time and tales about time. The Mahabharata is both a tale of time and a tale about time. For at the heart of this tale is its ethical project of refiguring our understanding of suffering. Emily Hudson’s Disorienting Dharma is in line with other Euro-American scholarly pursuits into Indian ethical and religious ideas like those of Max Weber, Paul Wilmot, David Shulman, Wendy Doniger O’Flaherty and James Fitzgerald. What is generally outstanding is her sensitivity to issues that are culturally and geographically alien to her, and her willingness to take on a text that is absolutely reluctant to provide any straightforward answers to life’s riddles. It is seldom that one comes across genuine scholarship these days like what Emily T. Hudson has exhibited in these pages. Her concern for the larger questions of human life through probing the profounder strands of the narrative textures and her unrelenting commitment to inquire into what each character and each specific situation in the text means at any given time and also to refigure it in the overall order of things, is quite clearly evidenced in her erudite critical reading.